There’s cold beers in the fridge. There’s mesmerizing art work polishing the walls. There’s second hand vintage records lining the front of the shop tantalising passers-by to pop in and check them out if the easy flow of hip hop music hasn’t already lured them in. There’s an exotic man with an inviting smile, a striking accent, dreadlocks and the most-eye catching vintage cash register by his side as he relaxes behind the counter. There’s a vibe that makes Le Garage feel much unlike any hair salon; instead, there’s a vibe that makes Le Garage feel like you’re kicking it right at home with some friends. Paris native Samaali has had his heart set on opening a shop like Le Garage since he moved to Sydney 11 years ago. “Surry Hills was an accident, but it definitely ended up being the right area that completely suits us and what we’re about.” Le Garage, which opened about three weeks ago, is like the ultimate kick-back and relax style hair salon to hit Surry Hills. But Le Garage is so much more than a hair salon. It brings a flavour and a flair that grabs people’s attention and triggers their interests with its street culture style and atmosphere. The second hand vintage records for sale are primarily what Samaali describes as black music from the late 1960s until now. There are murals jumping off the walls designed by local artists The Dirt, Quill Bill and Lady J. Le Garage also carries eccentric and unique pieces of jewellery from local, independent makers Lady J and Billy Kid. Le Garage has a pulse all its own, bringing a little bit of everything into the mix and making it work. Samaali is confident that it will only continue to grow and promote a culture that is slowly starting to change Sydney. “I think Sydney is slowly starting to become the new Melbourne,” said Saamli. Le Garage is open from Tuesday to Saturday. 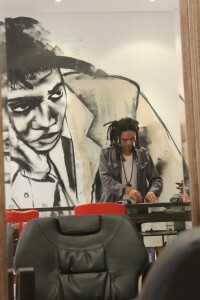 You can learn more about Le Garage through its Facebook Page at http://www.facebook.com/legaragehair.